Glove Plus Lightly Powdered Latex gloves are recognised as a high quality, high performance latex glove designed for use in areas of medium to high risk and where contact with blood borne pathogens and minimal risk of chemical splash to the glove user. Lightly powdered latex offers the glove user a glove that’s comfortable to wear, easy to wear and is ideal for use in a wide range of applications. The barrier properties of NR Latex make this the ideal glove for applications where the glove user is likely to be in contact with blood borne pathogens and other body fluids. This superior level of barrier protection extends to the barrier permeation of viruses. Glove Plus Lightly Powdered latex gloves have been tested to, and passed, ISO 116044b:2003 “Resistance of Materials used in Protective Clothing to Penetration by Blood-Borne Pathogens” (viral testing). Glove Plus Lightly powdered latex is manufactured to a watertight AQL of 0.65 for ‘pinholes’ which ensures a lower instance of tearing and product failure. These gloves incorporate a rolled (beaded) cuff which reinforced the cuff area to prevent tearing when putting the glove on and also allows for a secure fit to garments, helping prevent liquids entering the wrist area of the glove. The component materials in Glove Plus lightly powdered latex comply with 27CFR 177. 2600 which means that these gloves are safe for use with food. Being made of Natural Rubber Latex (NRL), this glove is not suitable for individuals who are sensitised to the residual water soluble proteins present in all NR Latex gloves. 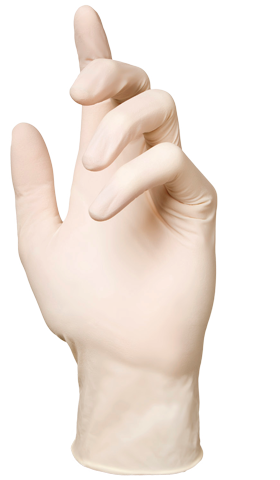 NR Latex provides the most comfortable fit of any disposable glove material available. Available in sizes X. Small (5-6) to X. 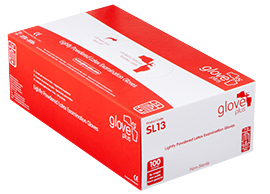 Large (9-10), Glove Plus Lightly Powdered Latex gloves are packed in dispensers of 100 gloves, 10 dispensers per carton.